It's difficult to catch everything during an election night whirlwind of facts, stats and spin. Beyond the immediate headlines, here are 20 things you may have missed. The SNP has suffered some of the night's biggest losses. Former leader Alex Salmond, who was Scotland's first minister between 2007 and 2014, lost his Gordon seat to the Scottish Conservatives. The SNP leader in Westminster, Angus Robertson, also lost his Moray seat to the Tories. 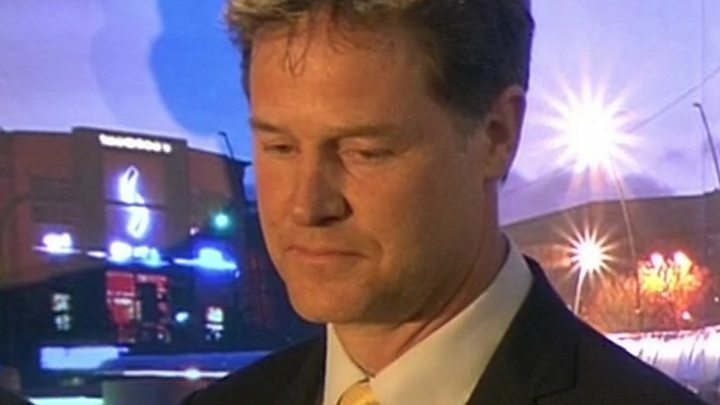 Former Lib Dem Leader and deputy PM Nick Clegg also suffered a fall from grace. He looked visibly upset when he lost his Sheffield Hallam seat - which he had held for 12 years - to Labour. But his departure didn't seem to shock everyone. "Who is Nick Clegg?" was one of the top trending questions on Google overnight. Turnout is the highest since 1997. It's up by 2% to 69%. It looks like Labour has been successful in persuading young voters to turn out and vote for the party. There has been a greater swing to Labour in seats with a higher population of 18 to 24-year-olds, according to professor of politics John Curtice. Turnout has also increased more in seats with young people - and Labour's vote seems to have advanced most in constituencies where the turnout increased most. A record number of female MPs have been elected. There will be 208 women in this Parliament, outnumbering the 196 women elected in 2015. About 30% of candidates were women this year - up from the previous record of 26% in 2015. However the actual number of women standing was down from 1,036 to 983. Mrs May may have had a terrible night, but the Scottish Conservative leader has arguably achieved one of the biggest success stories of recent UK political history. The Scottish Tories were wiped out by the Tony Blair landslide in 1997 and narrowly escaped oblivion again in 2015 when the SNP swept to power in 56 of Scotland's 59 constituencies. The party's single MP hung on by only a few hundred votes. Now they're back. The Conservatives won 13 seats in Scotland - the party's best performance in Scotland since 1983. The SNP are currently on 34 seats. Sunderland has historically been the first place to count and declare its results. But this year it lost out to Newcastle in the battle to be first, trumping its neighbour. Newcastle Central was declared first at 23:01 BST, followed by Houghton and Sunderland South nine minutes later. Sunderland has been the fastest to declare for the past six elections. New Labour MP Preet Kaur Gill retained the party's seat of Birmingham Edgbaston, becoming the UK's first female Sikh MP. The 44-year-old, who got a majority of 6,917, said her passion for politics was inspired by her late father and his close friend Lord King, who became the first Sikh peer in the UK. The seat of Birmingham Edgbaston has been continuously represented by women from both main parties since 1953. Labour has done well in seats that voted to Remain in the EU. The Tories have seen an uptick in seats that voted strongly to Leave, but far less than Labour's gain. The swing to Labour in seats where Remain won over 55% in 2016 is averaging seven points, whereas there is a 1% swing to the Conservatives in seats where over 60% voted for Leave, according to Mr Curtice. The Labour leader might have had a belter of a night, but he needs to work on his high-fives. Shadow Foreign Secretary Emily Thornberry appeared to get a slap across the chest when he overreached. Mrs May had an unusual opponent in her constituency of Maidenhead Lord Buckethead, who won 249 votes. It's not the first time he's tried to be an MP. In 1987, Lord Buckethead stood against Margaret Thatcher in Finchley, winning 131 votes. And in 1992, he stood against then prime minister John Major. Lord Buckethead wasn't the only odd person the PM shared a stage with. Bobby "Elmo" Smith, pictured above, got three votes. Lib Dem leader Tim Farron also had an unusual opponent in his Westmorland and Lonsdale constituency, Mr Fishfinger. Mr Fishfinger raised enough money to cover his £500 deposit through a crowdfunding page. He managed to win 309 votes. The battle for Richmond Park - between the Conservative's Zac Goldsmith and Lib Dem's Sarah Olney - came down to 45 votes after two recounts, with the Conservatives winning with a majority of 45. But there was an even closer race in Scotland. The SNP held onto the Fife North East seat by just two votes - 0.005% of the vote - following three recounts. Mr Farage resigned as UKIP party leader last July, but said he would have "no choice" but to return to frontline politics if Brexit was under threat. It wouldn't be the first time the former UKIP leader has done a U-turn. He resigned after failing to win a seat in 2015, but later decided he "owed it to the party to stay" on as leader. The Democratic Unionist Party (DUP) built its 2015 general election campaign around the idea that its MPs might be kingmakers at Westminster. But that's the position the 10 newly returned DUP MPs are now in given the hung parliament. Senior DUP figures have made clear their antipathy towards Jeremy Corbyn because of his historic links with Sinn Féin but Theresa May - or whoever succeeds her - could be a plausible partner, as both parties are pro-Brexit and right of centre on many issues. It's too early to say whether they might consider a formal coalition or a more informal "confidence and supply" arrangement, according to sources. The DUP website crashed on Friday morning after a surge of interest. DUP was also one of the most searched terms on Google. Could DUP be Westminster kingmakers? Mr Curtice's polling wisdom has attracted a bit of a cult following for years, but his social media fame reached a peak on election night. A Twitter page called, "Is John Curtice on TV", designed to monitor and celebrate Curtice's TV appearances, was started in April and has more than 8,000 followers. British politics has returned to a two-party system on the greatest scale since the 1970s. In 2015, UKIP achieved 12.6% of the popular vote, while the SNP won 56 of the 59 seats it contested. This year the vote share was Conservative 42%, Labour 40%, Lib Dem 7%, UKIP 2% and the Greens 2%. The SNP remain the largest party in Scotland but the Conservatives have won 12 seats off them so far, Labour has won seven and the Lib Dems three. The count in the extremely wealthy central London constituency of Kensington was suspended following a request for a third recount, because staff were too tired. The seat, which has been strongly Tory since its inception, finally went to Labour for the first time in its history. 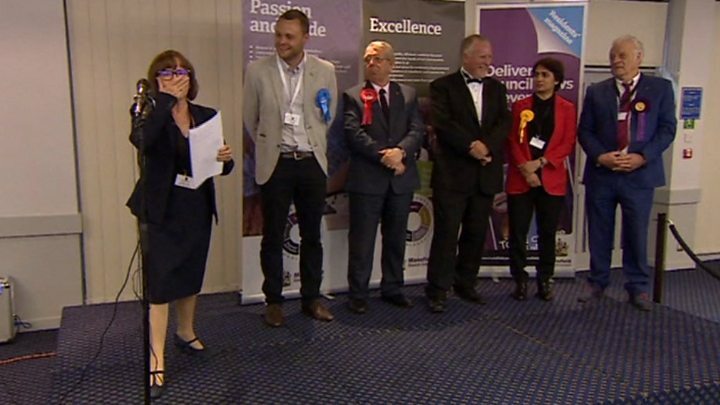 Mansfield, in Nottinghamshire, had its own version of the Oscars' "Envelopegate" - after the returning officer announced the wrong winning candidate. The Conservatives took Mansfield for the first time, overturning 94 years of Labour rule. On Friday morning, it was down more than 2% against the dollar at $1.26800 - its biggest single day drop of the year. It was almost 2% lower against the euro at 1.13300 euros. The biggest swing - 20.4% - was in Alex Salmond's constituency of Gordon, which went from SNP to Conservative.